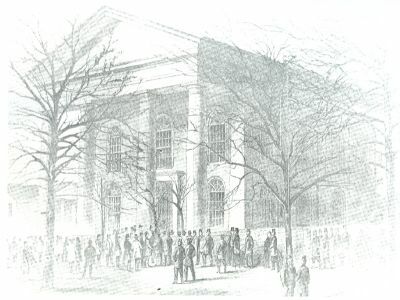 The Secession Convention of the State of South Carolina convenes in Columbia’s First Baptist Church, attended almost exclusively by slaveholders determined to defend slavery against the newly-elected president Lincoln, whom they perceived as a threat against the southern institution of slavery. A smallpox epidemic in Columbia would force the convention to move to Charleston, where the delegates on December 20 voted unanimously for secession. Four days after the vote for secession, South Carolina issued its Declaration of the Immediate Causes Which Induce and Justify the Secession of South Carolina from the Federal Union (link). In the document, white South Carolinians made clear that the underlying reason for dissolution from the Union was that of disagreements over slavery. The North was vilified for growing abolitionist sentiments, for refusing to help slaveholders recover runaway slaves, and for daring to state that slavery was sinful. White freedom, the delegates insisted, depended upon black slavery. And whites were not about to give up their freedom. In the ensuing days, weeks and months until the formation of the Confederate States of America, southern politicians routinely referred to the “non-slaveholding” states when referencing the North. In reality, many poor and non-slaveholding whites at large throughout the South were not entirely convinced by the rhetoric of slave owners. However, the influential men of the state were almost all slaveholders, and they publicly and ceaselessly insisted freedom for blacks endangered the lives, property and welfare of all whites. And so, secession began in a Baptist church, where the gathered white slaveholders wielded enough power to steer South Carolina out of the United States in order to preserve the institution of black slavery. December 23, 2010 in Archive: This Day in Civil War History.